Pegboard isn’t just for workbenches and garages! Here are 10 ways you can use the versatile material for organizing your craft supplies. It’s particularly good for those with small spaces. Once you have the basic pegboard, you can add shelves, pots, baskets and more by using a variety of hooks. You can even find pegboard organizer kits at DIY stores. What a great way to organize and personalize your workspace. 1. I adore this graphic version from Fabric Paper Glue above. Think beyond just supplies and add decorative touches like plants and posters. 2. Jen at Craft-O-Maniac basically has a wall for her craft space, and she made the most of it with this huge pegboard that she spray painted white. 3. 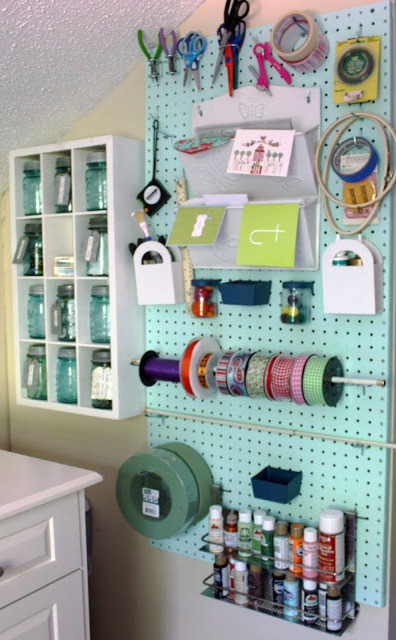 Speaking of small spaces, if all you have is a craft nook, pegboard can help! Traci at Beneath my heart converted a closet into her craft space and used pegboard painted blue for organizing lots of bits and pieces. 4. Why not frame your pegboard and turn it into a work of art like Dawn did? Her supplies are arranged so artfully! 5. Another framed option from honeybearlane. I am loving the way she organized her wrapping paper (bottom left), and vinyl rolls (top right). 6. Keep all your tools corralled like Leah did here. You’ll never wonder where your scissors are again! 7. Don’t forget the kids! Keep their painting supplies accessible but protected with this idea from Holly. 8. Even if all you have is a 2×4 space on the wall, you can get quite a bit organized on a pegboard! See how Kellie did it at Nest of Posies. 9. I love the neat way Shauna organized her small ribbon rolls on this pegboard. 10. Use pegboard with rows of clipboards to create an inspiration or mood board for all your different projects. What a great idea to add a clock too! Via The Design Files. I hope you got some great ideas and inspiration from these 10 sources. I know I did. Happy Organizing!